To celebrate the recently-published Register of the world’s 200 largest yachts, we have picked five of the finest, and largest, superyachts for sale. 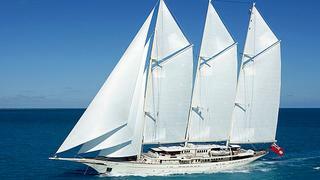 Ocean Independence are marketing for sale the famous 90 metre Royal Huisman sailing yacht Athena asking $75 million. One of the world’s largest sailing yachts, this iconic superyacht has a pure Dutch pedigree, combining the talents of Pieter Beeldsnijder for exterior design with the naval architectural skills of Dykstra Naval Architects and the craftsmanship of the celebrated Royal Huisman yard. Built to Lloyds class and MCA coded, Athena was delivered to industry acclaim in 2004. She boast superb engineering, state-of-the-art sail handling gear and interior joinery of the highest quality in lightly stained mahogany. Accommodation is for 10 guests in five cabins configured as a full beam master suite, three double staterooms with queen size beds and a single cabin. A regular at the world’s top superyacht regattas, Athena is as fast as she is good looking. On deck, Some 55 Rondal captive and drum winches allow lightning fast tacks under full sail while sails can be set and stowed at the press of a button or two. Delivered in 1921, the 78 metre motor yacht SS Delphine is the largest steam ship ever built in the United States. She was ordered by Horace Dodge and named after his only daughter Delphine. She had an impressive restoration completed between 1997 and 2003 with no expense spared. Accommodation is for 26 guests in two VIP suites, nine double staterooms and a four-bunk cabin. Power comes from two 1,500hp quadruple steam expansion engines. 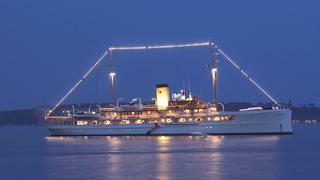 Currently moored in Tunisia, SS Delphine is asking $39 million with Northrop & Johnson. 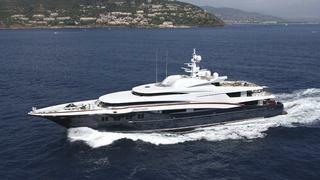 The 75.5 metre motor yacht Anastasia is listed for sale with Edmiston & Company. Anastasia was built by Dutch yard Oceanco in 2008 to a design by Sam Sorgiovanni and her sleek profile houses seven decks of outstanding accommodation, including a duplex master suite, cinema and a main saloon that doubles as a nightclub. 12 guests are accommodated in a master suite, two VIP staterooms and three double cabins. Half of the lower deck is dedicated to a an enormous garage which houses large custom tenders, a vast array of jet skis, wind surfers and full dive equipment. Hullside doors fold down to assist with launching and also create huge balconies over the sea. Lloyds classed, Anastasia is asking €125 million. The 75.5 meter motor yacht Northern Star was designed by Espen Oeino and she was built by German superyacht yard Lurssen with a launch in 2009. British designer Pauline Nunns gave the yacht’s voluminous interior an ‘English country house’ style and she comfortably accommodates 12 guests in six staterooms with room for as many as 26 crew. Guest accommodation comprises a master suite, VIP stateroom, two doubles and two twins. All have en suite bathrooms. 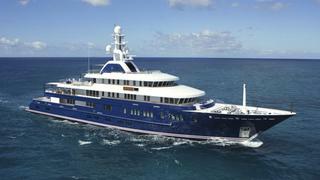 Northern Star is asking €115 million through Moran Yacht & Ship. Burgess are jointly listing for sale the 68 metre motor yacht Sycara V with Merle Wood & Associates. Built by German superyacht yard Nobiskrug, Sycara V was delivered to her owners in 2010, going on to become a winner at the 2011 ShowBoats Design Awards. With exterior styling and interior design by Craig Beal of Pure Detail, the interior of Sycara V is dedicated to spacious living, as can be seen on the main deck, which offers an open space of more than 25 metres from the dining room to the library, providing the feeling of living in a penthouse. The entrance to the yacht leads into a wide lobby with an elevator, which connects all the decks from the lower deck to the sun deck. Her 14 guests are accommodated in seven spacious and well appointed staterooms. The bridge deck is mainly allocated to the owner with a private aft deck for al fresco meals. The six guest cabins on the lower deck are situated around the main staircase and, to accommodate families with children, several staterooms have additional Pullman berths. There is also a large furnished beach club and she has port and starboard tender bays complete with 31′ and 23′ tenders. 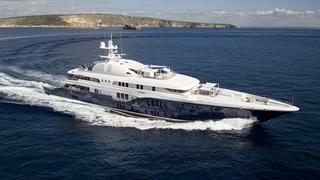 Lloyds’ classed and MCA compliant, superyacht Sycara V is asking €69.5 million.